Home > vengeance squad > "Death"-- Titles Revealed! 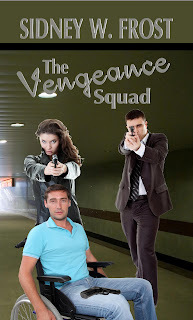 Excerpt A is from The Vengeance Squad by Sid Frost. She smiled at me even though I knew she must be in extreme pain. “Thank you for loving me,” she said. She sank into my arms as her life left her body. *Sidney W. Frost is a former computer science professor, ex-marine, and author of Where Love Once Lived, a prize winning inspirational novel. Lady Charlisse Bristol sets off on a voyage in search of a father she never knew, only to find herself shipwrecked on a deserted island. After weeks of combating the elements, her salvation comes in the form of a band of pirates and their fiercely handsome leader, Edmund Merrick. Will Charlisse free herself from the seductive lure of this pirate captain and find the father's love she so ardently craves? While battling his attraction to this winsome lady and learning to walk a more godly path, Edmund offers to help Charlisse on her quest--until he discovers her father is none other than Edward the Terror, the cruelest pirate on the Caribbean. Can Edmund win this lady's love while shielding her from his lecherous crew and working to bring her father to justice? Can the supernatural power of God rescue Charlisse and Edmund from the danger and treachery that await them as they ride upon the tumultuous waves of the Caribbean? What a treat we're in for next week, as I sit down with the authors and find out more about the characters driving their stories. They'll be here to answer your questions as well. And remember that your visit and participation places you into the book drawing held next Friday. Every tweet and facebook mention ups your odds too, provided you let us know you've done so. MaryLu and Sid! No wonder both of these excerpts were so good! It was a tough choice and both books look awesome. Would love to win either! Thanks for stopping by Elaine...and thanks for the kind words. I loved The Vengeance Squad but have not read The Redemption and look forward to reading. Both were great excerpts. Good morning you guys! (Kinda late morning, I realize.) Thanks for being here today. I've got you in the drawing. Good luck and have a fantastic afternoon. These books look great! Please enter me into the drawing! Good to hear from you rhoda1111. Please watch this blog in the future. Linda and Rhonda, I've got you down. ;) Thanks for popping by, we love having you here. Look forward to reading The Vengeance Squad. I'm always looking for GOOD Christian writing! Thank you, LifeDance. You may want to check the followup here: http://www.clashofthetitles.com/2012/01/vengeance-squad-interview-with-sid.html.